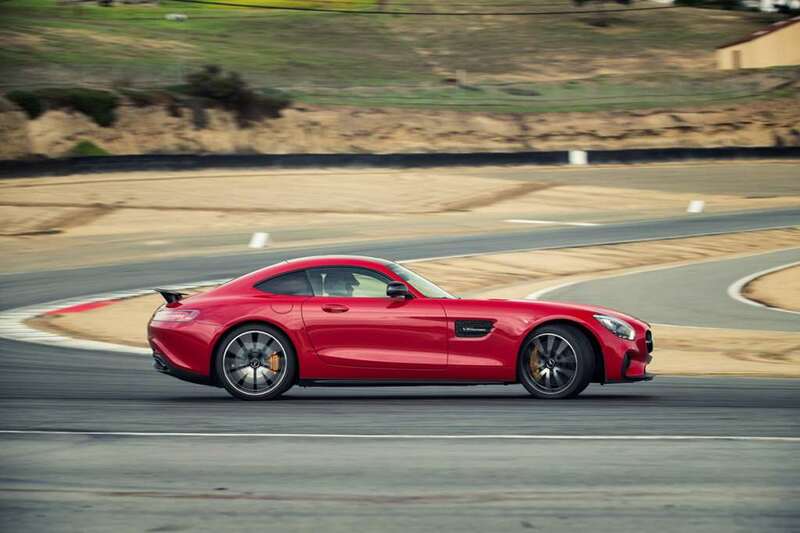 Turbocharging is supposed to gag the vocal qualities of the gasoline internal combustion engine, but the team at AMG clearly ignored this engineering stipulation. 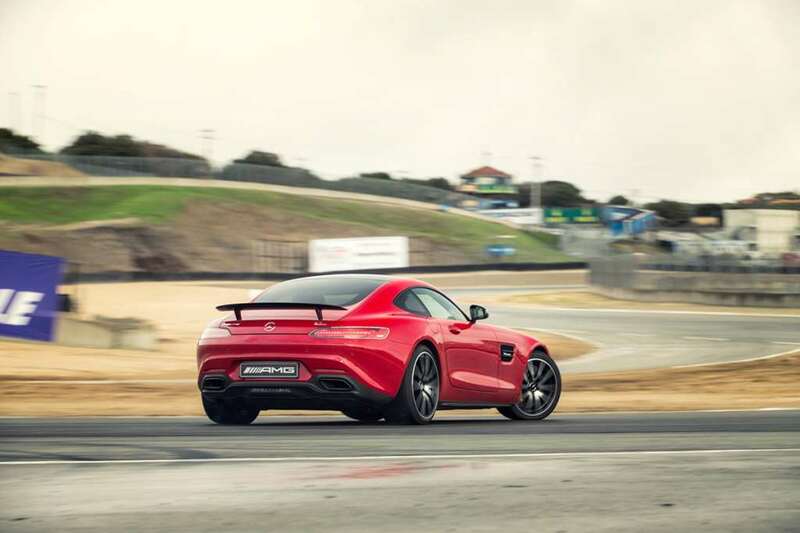 The start-up Ka-ka-ka-BOOOOOOOOM of the new twin-turbocharged GT S coupe is, if anything, even more cacophonous than the last generation normally aspirated AMG V8s. With the exhaust flaps set to noisy, it booms and fidgets at idle and each little exploratory prod of throttle sees the revs shoot above 4000rpm and is followed by great cracks and crackles of ECU overrun fakery. Even when stationary, the GT S is more exuberant than a Porsche 911 at full-chat. 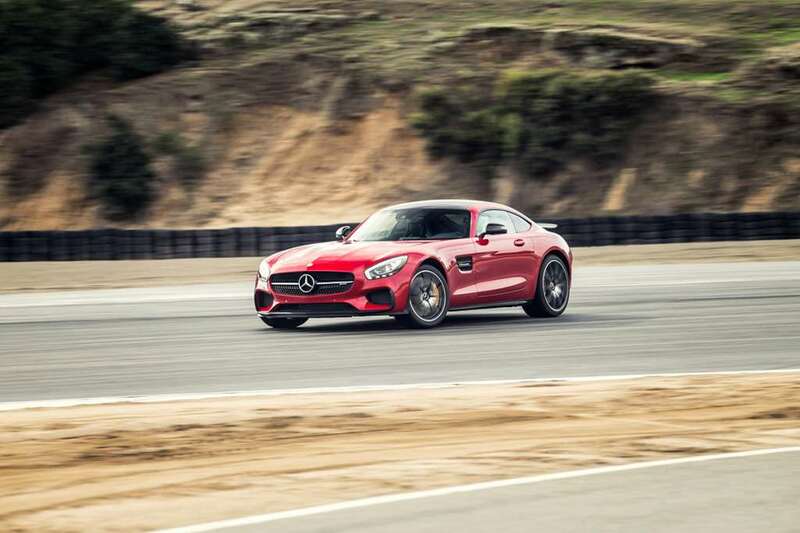 Previous experience tells us that AMG knows how to do exuberant very, very well – what we didn’t know was if the company’s first attempt at the toughest sports car sector of them all, the one named after that pesky Porsche would be a step too far. I’ve just spent a day at Laguna Seca Raceway attempting to answer this. First we should discuss the subject of styling – not something I should be doing because I normally refuse to pass judgment on subjective aesthetics, but you need to know one thing about the GT – it somehow doesn’t quite work in photographs, but it really does in the flesh. If you’re drawing breath between a clenched jaw and shaking your head, just wait until you see one on the road – it’s a great shape. It looks short, wide, low and aggressive. The long bonnet, truncated bottom shape is undeniably Jaguar F-Type Coupe in silhouette, and it has purpose. The cars we used on track were the Edition One launch specials with some rather inadvisable nose and tail additions – the standard looks far better to my eyes. The GT is in effect a cut-down SLS. It uses the same track widths and much of that car’s floorpan. The front suspension is carried over too, as is the hydraulic steering rack. Both of these are very good news: the front suspension assembly is massively over-engineered and effectively of race specification, and we all know how well electric power steering appears to be going down with the enthusiast community. Entering a battle with the 911 carrying a hydraulic rack is like tackling Superman with a fluorescent green rock in your pocket – a very handy advantage. So the wheelbase is shorter than the SLS’s, and into the rear is attached an all-new rear suspension assembly: multi-link in design, and on this ‘S’ model a transaxle dual-clutch gearbox that incorporates a variable locking differential. Connected to this via a whopping carbonfibre prop-shaft is the new twin-turbo V8, codename M178. Wedged in behind the front axle line, it’s a packaging miracle with two turbochargers sitting in between the cylinder V – fed by an intake tract that runs down the length of the underside of the bonnet and directly into the heads – creating what AMG calls the ‘Hot-V’. Capacity is four litres and the outputs place this car firmly in 911 turbo territory: 510hp and 479lb ft. That’s for the launch model GT S – a less powerful 462hp GT arrives next summer in the UK. It will be a more direct rival for normally aspirated 911s, but still way more potent than the Porsche. It’s a very trick motor, dry-sumped and with minimal intake length to provide the best possible throttle response. It uses complicated engine mapping to create a torque curve that should feel almost normally aspirated. Interestingly, in full manual mode with the RACE setting engaged, a little more torque is allowed in the mid-range. I only drove the car, a GT S Edition One, on track yesterday, so that’s the driving behavior we’ll discuss here. I’ll have a go on the road later today, but Mr. Editor Chris-R wanted his words pronto! Joy of all joys, the driving position is perfect – it wasn’t quite in the SLS. The wheel pulls close to your chest, the special bucket seats are quite thinly padded but clinch in all the necessary places and the centre console is high and wide. On it are large, widely spaced buttons for all the chassis and transmission options. Three damper settings, numerous transmission settings, including a full-manual mode for the Getrag dual-clutch 7 speed ‘box which is heavily updated over the SLS – and needed to be. 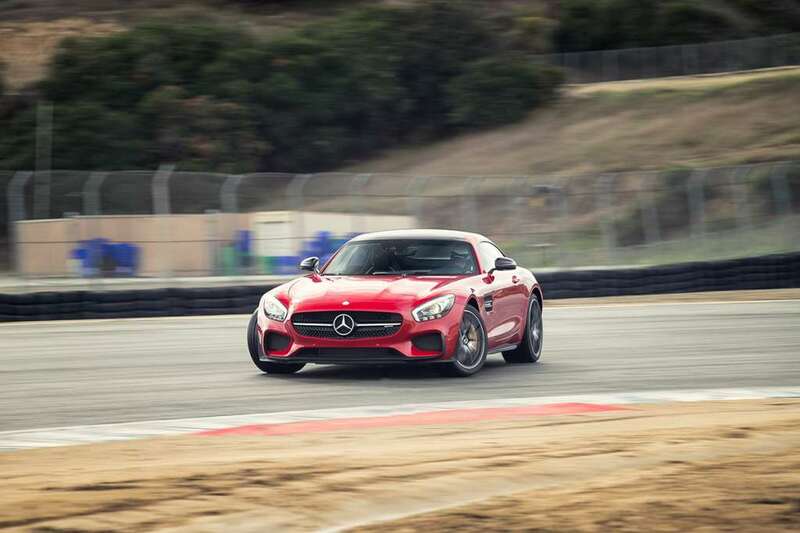 Rolling away from the pit-lane exit at Laguna, the GT S feels instantly potent – and not just ordinarily quick – the turbo V8 spits it forwards with unexpected force and you instinctively grab another gear to calm the thing down. But it just keeps on pulling. The effective power-band is from 3000rpm to 6500rpm – the final 500rpm doesn’t add much beyond the ability to hold a gear into a braking zone. And it’s a characterful motor – the volume is high, the urge is instant and the over-run crackles get louder the harder you try. It doesn’t quite have the same response as the last M156 normally aspirated AMG V8, but it counters by offering brutal mid-range and, dare I say it, an even better noise. As an exercise in attempting to replicate a high performance atmospheric engine with something blown, I think this is the best I’ve seen. BMW’s V8 (M5/X5M) and straight six (M3/M4) are great efforts, but this matches sheer performance and surprising response with real character. The chassis is better still. 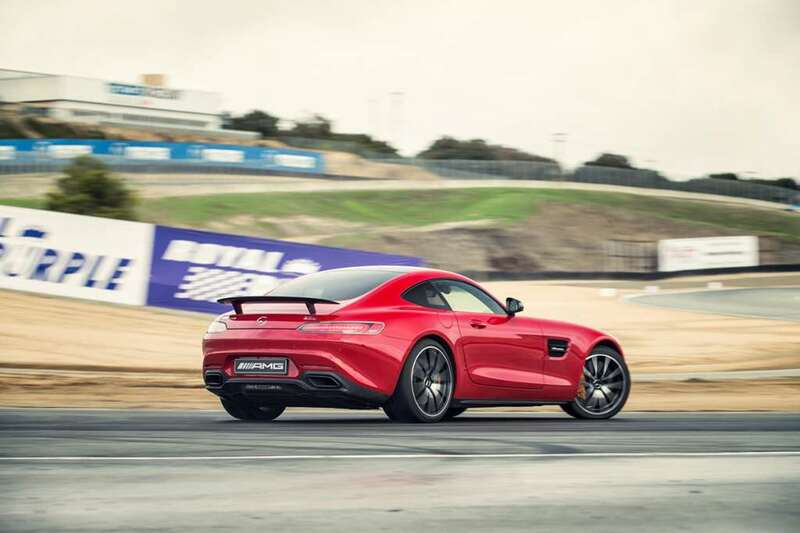 That short wheelbase brings more agility than in the Gullwing, the car turns accurately and predictably and as a driver you feel more naturally positioned within the car than in the long-nosed SLS. The standard Pilot Super Sports grip really well at the front axle and traction is really superb – better than the SLS. But what really surprised me, and what confirms all the hard work on eliminating turbo-lag is the way you can adjust the line with the throttle several times in a given turn. The car feels adjustable and playful. With the powertrain set to Sport Plus, the ESP in Sport mode and the dampers in the firmest position, anyone could drive the GT fast. The ESP and ABS intervention is so smooth and progressive you hardly know they’re working and you take huge liberties trail-braking into turns. 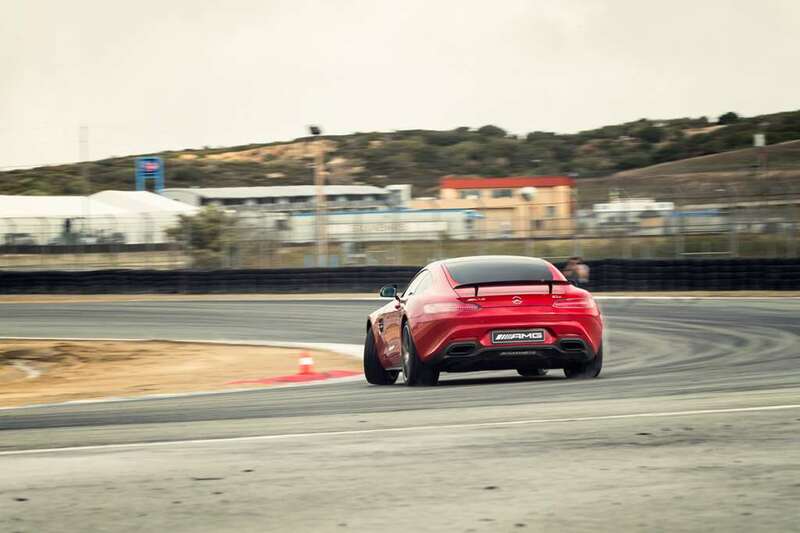 The brakes, optional ceramics on the test car, are immense – no fade after four laps of Laguna. The whole powertrain is suspended on dynamic engine mounts that can stiffen when needed: you can feel them working on the track and it feels more nimble than the 1540kg kerb weight would suggest. I expected this car to be belter, but it’s actually exceeded expectations. I need to go for a pootle on the road and try the gearbox in slush mode and see what the ride is like with the dampers in pillow mode and then tell you more about the packaging and the cabin and the size of the glovebox, but right now I love the quasi-hot rod character matched against some real track ability – wrapped in a body that works outside the sports-car cliché. Will report back again when I’ve had a go on the road (update: which you can now read here). For now, I’d put that F-Type R order on hold. Stand back, Merc's new GT is going racing!